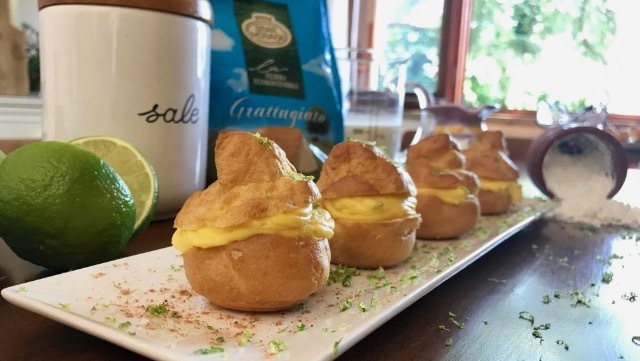 Cream puffs with Gran Moravia and lime custard - Brazzale S.p.A. These wonderful puffs will prevent such banality of canapés and sandwiches, putting on the table their originality and simplicity. First you need to make the cream puffs with the choux pastry, so you must put in a saucepan the milk, water, a pinch of salt and sugar and finally the butter. Melt this mixture over low heat and bring it to a boil; then move the saucepan from the heat and add the flour, stirring with a whisk. Put again the mixture on fire until the dough is smooth and no lumps and when at the bottom of the pot there will be a patina, you must to transfer the blend into a bowl (or use a kneader) and stir with a whisk to cool it. Now add the eggs, one at a time, and continue stirring until the dough is uniform. Transfer it into a piping bag and form the cream puffs on a baking tray lined with baking paper. Bake them for 25 minutes in preheated oven to 200°C (do not open the oven door during cooking). Now take charge of the cream and put the milk in a saucepan with nutmeg, salt and lime zest and bring to a boil over low heat. In a bowl mix the grated Gran Moravia with starch and add double cream, mix and pour the mixture into the boiling milk and continue stirring for a few minutes with a whisk until it thicken. Combine yolks and mix for one minute until the cream is perfectly thickened. Cool the mixture into a baking dish with a contact film and then put it into a piping bag, cut in half the cream puffs and stuff them with custard, sprinkle them with a bit of lime zest and… Enjoy your meal!